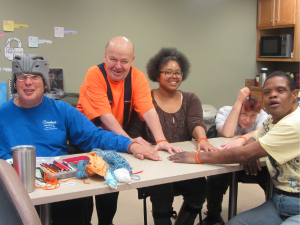 At The Arc of Evansville, we value our donors, volunteers, and business partners in the community who help us provide high-quality programs to the individuals with disabilities we serve each day. Getting involved with The Arc of Evansville is an easy, rewarding experience that can help make a significant impact on hundreds of lives of individuals with disabilities. Whether you want to become a member of The Arc of Evansville by joining local advocates to help continue our mission, become a member of The Arc of Evansville Annual Gift Club, make a monetary or in-kind donation, or volunteer, there are many ways to get involved and show your support. On any given day, individuals served by The Arc of Evansville are reaching milestones, acquiring new skills, and fulfilling life-long dreams. We see children taking their first steps, writing their names, and learning to read, which are typical accomplishments for most children. However, too often these tasks are steps that children with disabilities are not expected to accomplish. We hear individuals say “I love you” to their mom for the first time after learning to use an electronic communication device that helps them say the words. We witness adults with significant disabilities volunteer at local nonprofit organizations in our community. We employ individuals with disabilities to be members of our production team at Arc Industries where they provide assembly and packaging services for local manufacturers. Every day, without exception, the children and adults served by our agency are achieving more than others ever expected. They are fulfilling their personal hopes and dreams and striving to achieve even more as one success leads to additional successes. We are blessed to have the support of our many donors, community partners, and friends. We thank you for continuing to support our mission over the past 60 years. Because of your support, we have the ability to make dreams come true for the many individuals and families we serve.